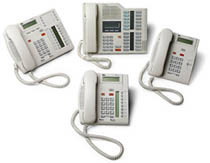 Nortel Norstar Business Phone System Phones represent a feature-rich portfolio with enhanced capabilities that provide business telephone solutions for a broad landscape of phone users, from high-volume call positions and executives, to low-intensive users and small workgroups. Nortel Norstar T-series phones (T7316e, T7406, T7208, etc.) are the latest generation of Norstar phones and have replaced the M7000 series for use with the Norstar ICS and Nortel Business Communications Manager (BCM) phone system platforms. We also carry the older M-Series Nortel Business Telephones, M1 platform Meridian M3900 and M2000 Series phones, the popular Meridian M5000 and M6000 Centrex phones as well as Nortel's line of small office / home office phones.